Make sure to click the image below to see who else linked up and read their fall memories. Fall is such a great time in the classroom. Nature walks, pumpkin investigations, apple prints and all the fun that comes with muddy shoes and leaf bits being tracked into the classroom. I have several new products focusing on fall that I'd like to share with you. 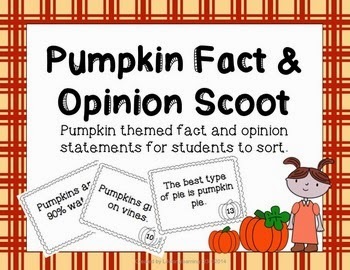 Pumpkin Fact and Opinion Scoot: Students reinforce their understanding of fact vs. opinion statements in this fun, fast paced activity. Students scoot from one card to the next as they determine wether the pumpkin themed statement is a fact or an opinion. 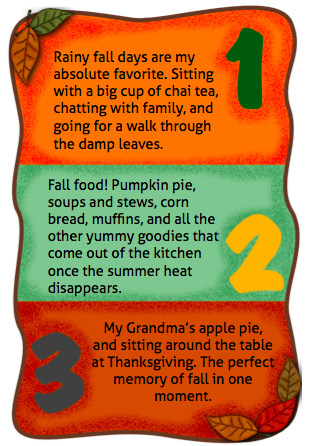 Fall Themed Morning Work (levels K-1): Everyone needs time fillers every once in a while. 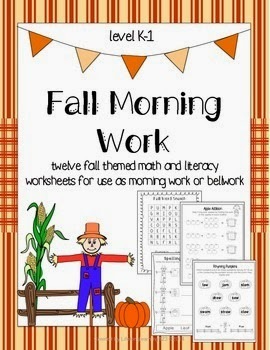 This package contains 12 fall themed worksheets at the K-1 level for use as morning work, bellwork, or as a quick time filler during the autumn months. With activities like 'rhyming pumpkins', 'apple addition', and more. What is your favourite fall memory? 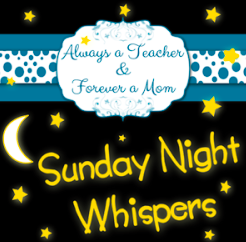 Do you have a fall activity that you love to do with your class?